Hi it's Jeff with Sunniland patio. 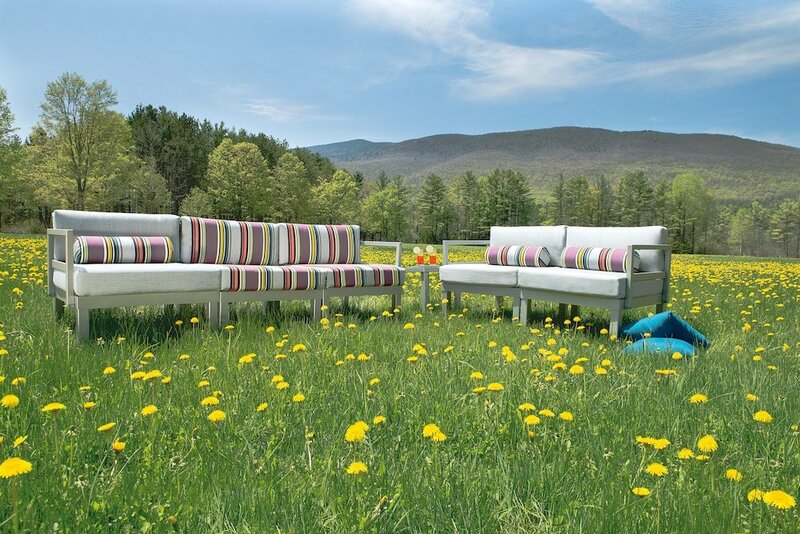 Today I wanted to talk about our universal replacement patio cushions we offer. Welcome to my shop! You can either watch the video above or read the summary step-by-step transcript below. Alright! These are some of our universal replacement cushions very common among a lot of aluminum styles and PVC furniture you know still uses the same today when you find it. It could also be a good fit for a lot of different furniture and a reasonable cost actually too if you can't find the exact pattern you're in need of. One of the things I wanted to show you is how we measure these so that you can maybe check out your furniture and see if one of our sizes might work for you. They are all made of Sunbrella and 100% acrylic so very cleanable, washable, fabric even bleachable, just make sure you rinse off bleach if you use it. We have the polyester thread which is UV resistant and then inside is a foam core with the Dacron or polyester wrap around it too. Most all of them have ties at the break actually and then some of them also will have ties at the top. The higher back cushion will have the ties at the top of the back to keep it from falling. They stay pretty good in place but that's just a bit extra we put on there. Going back to measuring the cushions there in the corners you'll notice this style of cushion has like a T it comes to. This line going up and down over the thickness that's the line we're measuring to get. So that line to that line (as shown in the picture above) would be what we would have as width on the website and then if we turn the cushion sideways to take the next measurements. We're going to measure from the front of the seat to where the hinge is (where it breaks in two) and then from where the hinge is to the top of the back using that line again at the at the top. So that's a pretty good rule of thumb to use. 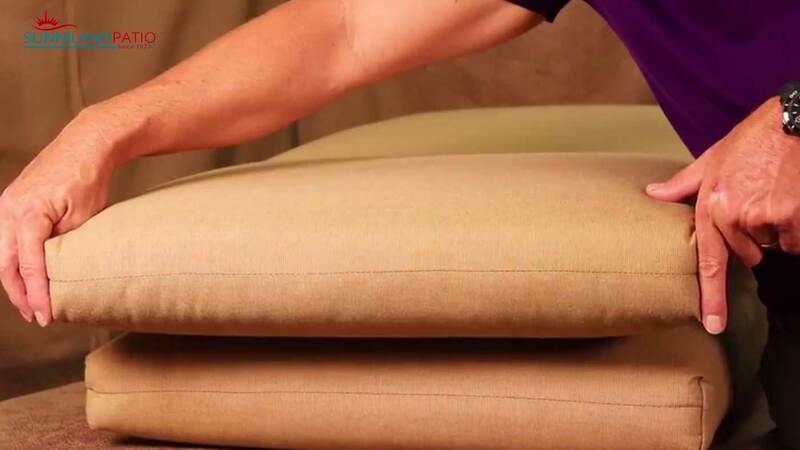 We use it this way because you can see that the cushions can kind of billow out a little. 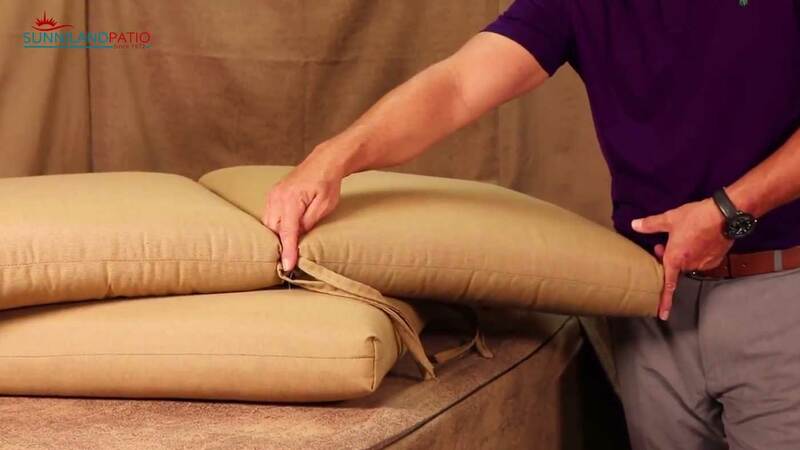 A lot of us can also make the mistake of measuring down the side of the cushions so you come up with a much wider measurement than what you're actually measuring for. A lot of styles are about four and a half inches thick so take that into consideration if you're trying to use them as a substitute for your furniture. Want to learn how to measure other patio furniture parts? Or even get design ideas for a cushion refresh. Check out the blog for more, or browse other articles below.